Have you seen that post floating around pinterest? 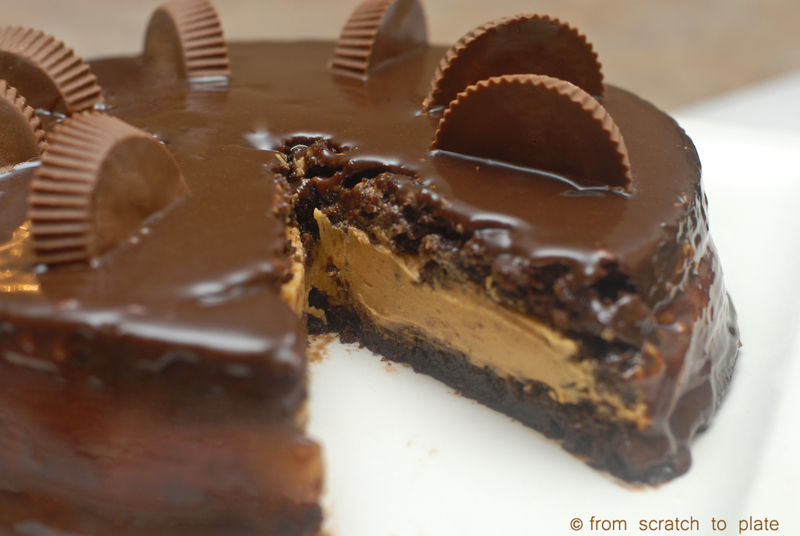 It’s a Reese’s Peanut Butter Cup Cake…it looks exactly like a humongous peanut butter cup. Well, I thought it was pretty awesome and my soon-to-be-nine-year-old decided he wanted it for his birthday cake. So, I clicked on it, planning to make it. Okay, so maybe some of you don’t mind spending 80 bones on a birthday cake, but that is WAAAAYYYY outta my budget. (Yeah, I’m married to a teacher, after all. He has two masters degrees. Don’t get me started.) So, the next best thing is to recreate it. 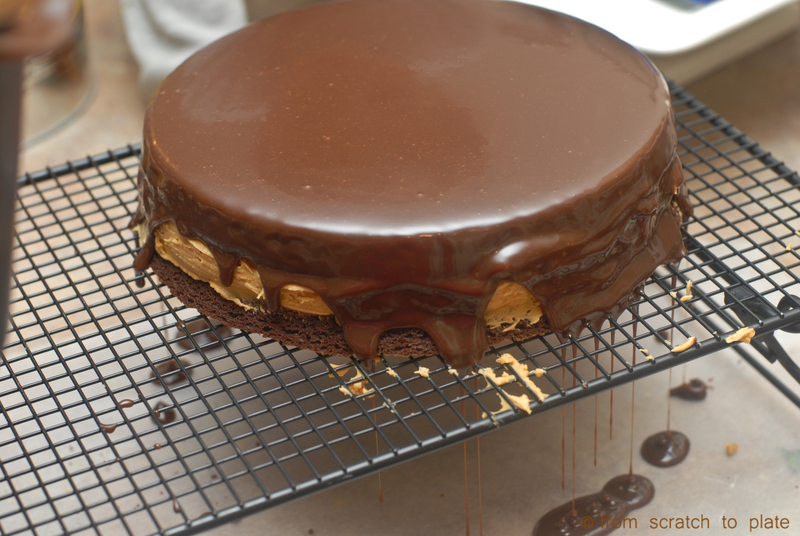 Not too hard: chocolate cake, peanut butter filling, milk chocolate frosting. 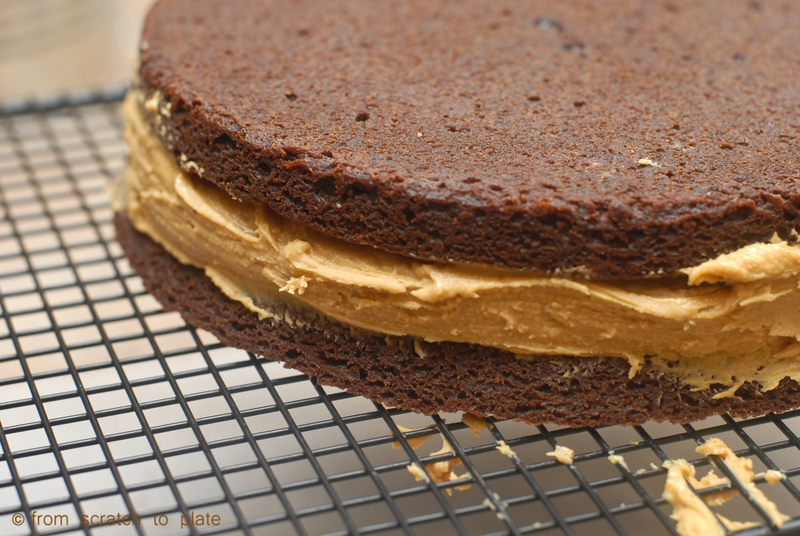 But, (I thought in my devious-non-calorie-counting-inner-mind) maybe I could IMPROVE on the concept…switch out the cake for brownies (we’re not much of cake people, we tend to have pie for birthdays), keep the peanut butter filling, then cover it in a milk chocolate ganache. Mmmmmmm…I’m sold. So, I HAD to do a trial run during spring break, so I could take pictures (otherwise my poor birthday boy would have to wait to indulge on his birthday until after my 30 minute staging and photographing fiasco. I figured that wasn’t fair). I learned a lot, and I’ll be making this again before the birthday to take more pictures, as I discovered that it really does need to be refrigerated before cutting into it, although it tastes divine without it, it’s very messy. The kids didn’t mind. So, enjoy the “messy version” pictures. I’ll post with nicer ones in a few weeks. And, as I discovered when I had a piece for breakfast the next day, it actually tastes better chilled. So, plan to make this a day ahead. It’s a little labor-intensive, but ooooooohhhhhhhhhh-so-worth it. Preheat oven to 325 degrees. 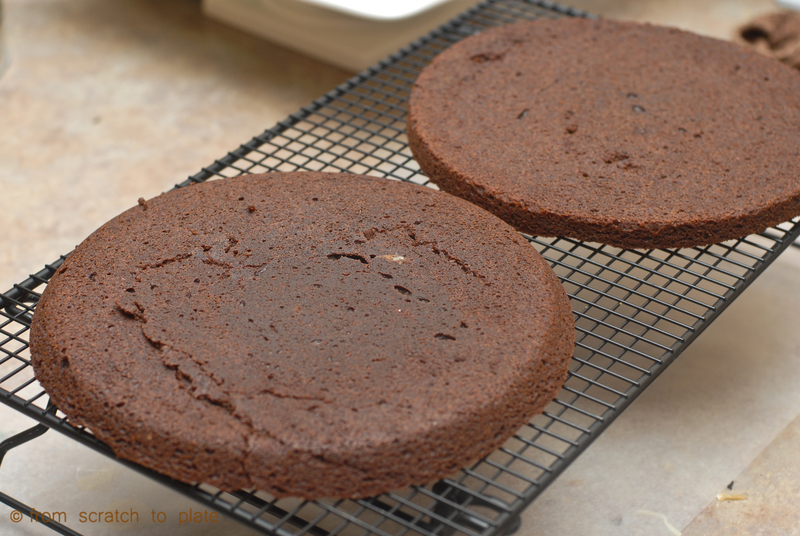 Spray two 9″ round cake pans with cooking spray. Line the bottom of each with a piece of parchment paper cut to fit. Respray over the paper. This will ensure no problems getting the brownie out of the pan. In a medium bowl, mix together cocoa, sugar and eggs until well mixed. Slowly pour in the melted butter and mix well (be careful not to cook your eggs by pouring hot butter in all at once). Add the flour and mix just until blended. Divide equally between the two pans. Bake for 25-30 minutes, or until a knife inserted near the center comes out clean. Do not over bake. Cool in the pans on a rack. Combine ingredients and beat with a mixer (whisk attachment if you have one) for about 3-5 minutes, until it becomes very smooth. Set aside until brownies are cool. In a small saucepan, over medium heat, heat the cream until bubbles form around the edges. Remove from heat. Dump in the chocolate chips. Let sit for 5 minutes. Stir well, until well combined and chocolate is completely incorporated. When brownies are cool, run a knife or metal spatula along the edge of each brownie, loosening it from the pan, then gently turn each over onto a cooling rack. They should come right out. Remove and discard the parchment. Generously cover the bottom layer with filling. Align second brownie on top. 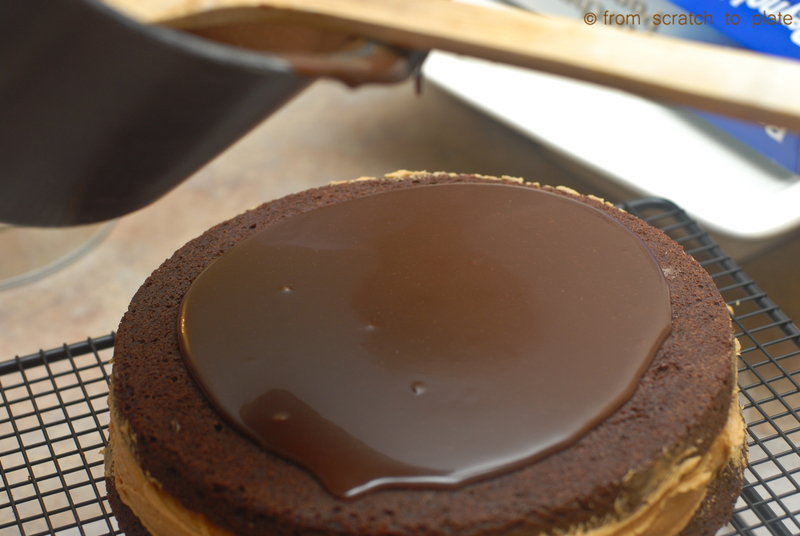 Pour some of the ganache on top, until it starts to pour over the sides. At this point, refrigerate the cake and the remaining ganache. About 30 minutes later, remove the cake from the fridge and “frost” the sides with the ganache. 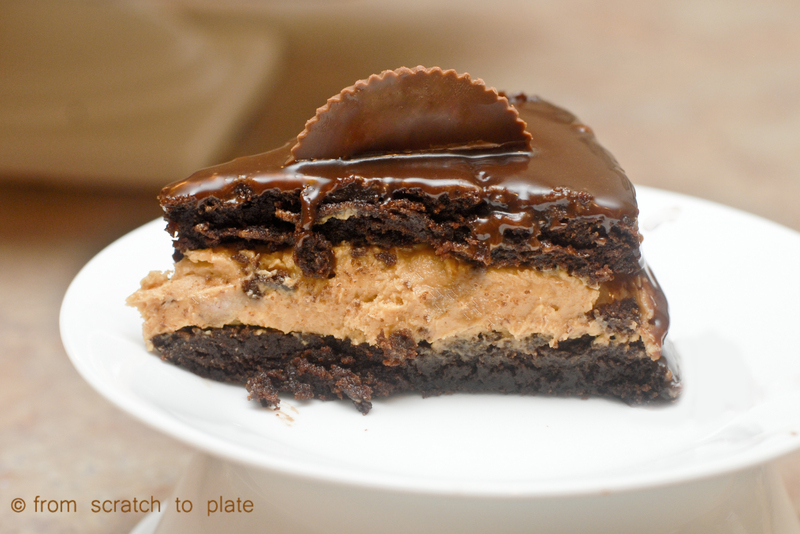 Smooth over any bumps and garnish with Peanut Butter Cups as desired. Return cake to refrigerator and chill for at least 2 hours before serving. 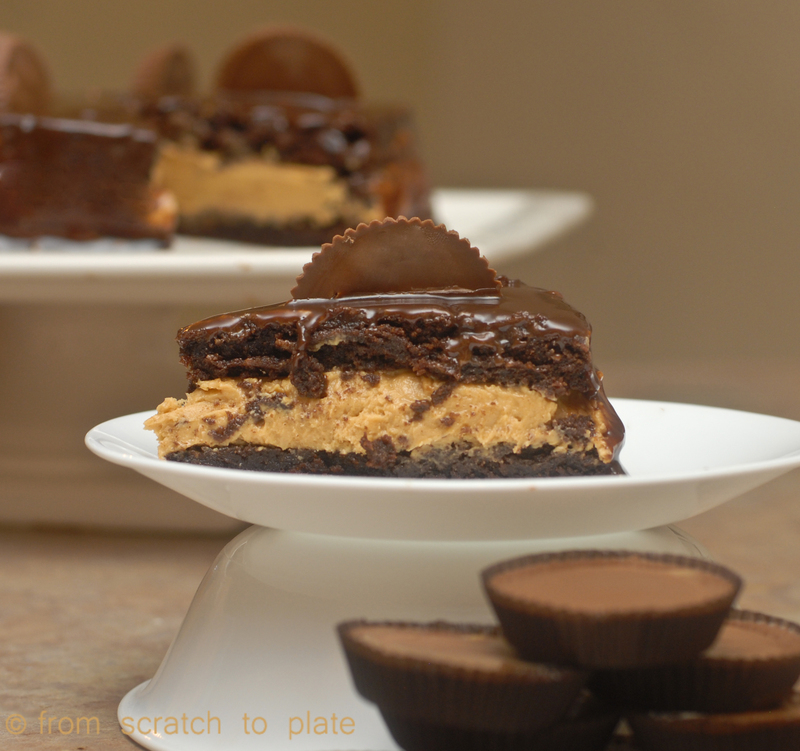 REAL food alert: Thanks to this recipe, I discovered that our beloved Reeses’ Peanut Butter Cups contain TBHQ, a preservative linked to stomach cancer. I almost cried. Okay, not really…but I was sad…and annoyed. I assume natural food stores have PB cups that are TBHQ free. 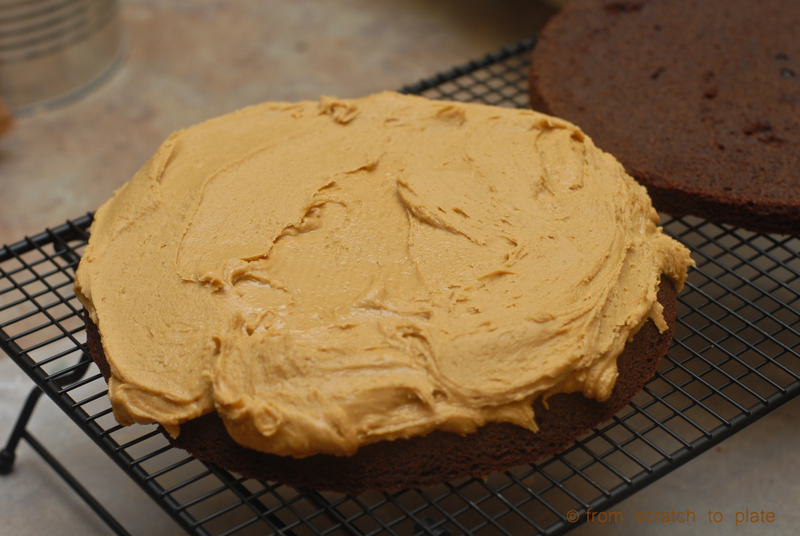 Speaking of peanut butter, I use all-natural pb…meaning the ingredients are peanuts and salt. If you use conventional peanut butter, you may want to cut down the sugar a bit. aaand, last but not least: chocolate chips. Check for artificial flavoring in your chocolate chips. ALLERGY alert: This can easily be made gluten free by subbing brownies with a gluten-free brownie recipe. Be sure to use soy-free chocolate chips if you have soy allergies. HEALTH alert: are you kidding me? This is unhealthy…it’s a waste of time to health-it-up. Just eat a small piece and then go hike up a beautiful mountain.